Hellboy and the B.P.R.D. 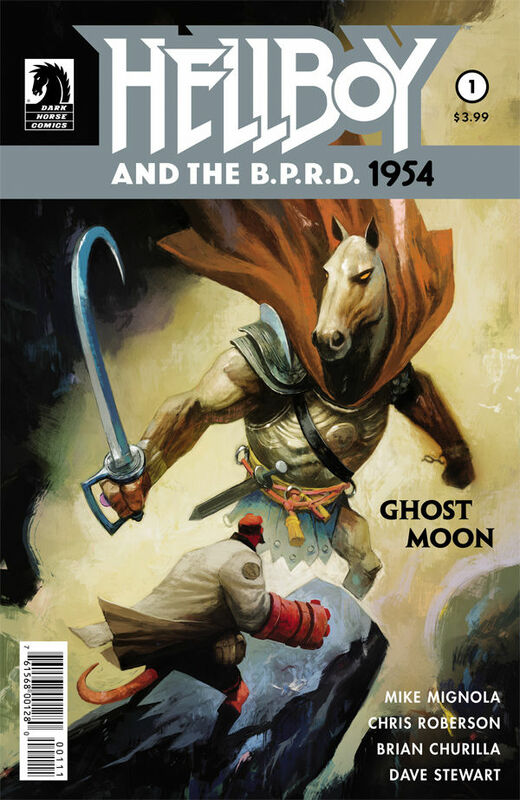 1954: Ghost Moon #1 kicks off a new adventure in Hong Kong as Hellboy and company track down a spirit jar. The story explores a bit of Chinese culture as they come against some strange creatures. This is definitely one case were bullets won’t do much good. Hellboy, Sue and Archie explore the streets of Hong Kong during the month of the Ghost Moon. They’re in search of a missing person and an item of great interest. Tracking down clues, their search brings them to a rundown building, a mysterious Chinese man with a spirit jar full of spirits, and a pair of monsters, and the missing man. However the monsters prove stronger than anything Archie and Hellboy have in their arsenal. The issue ends on a cliffhanger with everyone’s lives at stake. For the first issue of a new arc, Ghost Moon #1 is great. It has suspense, mystery, action and intrigue. It leaves you wanting more, but manages to deliver a satisfying chunk of story to satisfy your thirst. The writing is pretty good with excellent pacing, development, good dialog and a great little story. Paired together with some good artwork, and it makes this issue definitely worth checking out for Hellboy fans. I give it a five out of five metal bikinis.